Tire Blackheads stainless steel is used to remove blackheads and comedones. 3 Claveles Tire Blackheads is professional tool for high performance. Composed of high quality stainless steel, it is sterilized. Removes blackheads and excess oil without leaving traces on the skin. The use is very simple. Pressing the blackhead takes for the pressure on the skin make out the impurities and sebum. They are then collected by the tool. It will be used after a facial that will open the pores and scrub that will remove dead skin and impurities. After use, we can apply a sanitizer and soothing care. 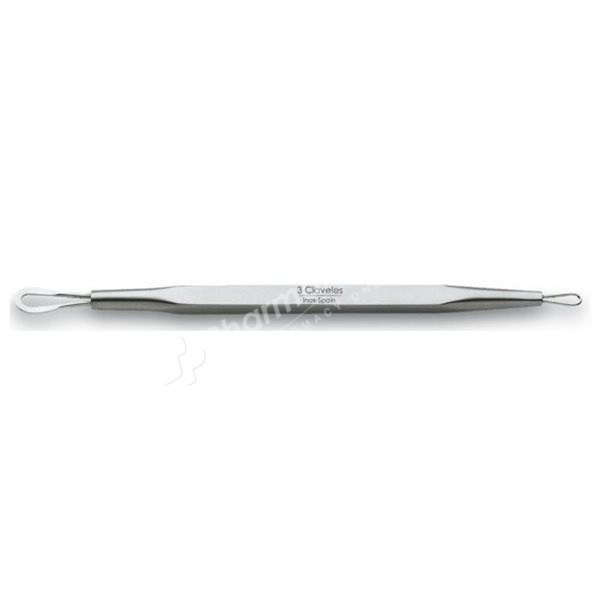 3Claveles Tire Blackheads is 12 cm. So it fits every hand. Practice, it has 2 couplings on each end: a large tip for resistant blackheads and finer for finishing. 3Claveles Tire Blackheads is a product guaranteed for life against defects in workmanship under normal use.